Top celebrities and industry insiders filled the bustling snowy streets of Park City, Utah during The Sundance Film Festival 2017 to get a glimpse of the latest and greatest in independent filmmaking. Besides the myriad of interviews done by the media and racing to premiers and their parties, the ‘Celebrity Hospitality Lounge’ has become a coveted place for VIPs to get pampered while experiencing the newest products and services that include everything from great gifts, to beauty/spa services, to delicious eats, satisfying beverages and top entertainment. One of this year’s best was the Power & Industry’s Indie Lounge in its 7th year and as entertaining as years past if not more. Known for courting top tier celebrities; the latest musical talents, and entertainers from across the film and music industry were seen and heard within their walls. The lounge was full celebration mode day and night with great music, panel discussions and unique entertainment to showcase seasoned and up and coming talent while indulging their guests with overflowing libations, courtesy of ABK 1308 craft beer, Bogarts vodka and Lead slingers Whiskey. There was also an abundance of food and snacks for hungry festival goers braving the cold and icy streets. The Lounge was chock full of Netflix, Sundance 2017 film leads, Oscar, Golden Globe, Emmy winners and nominees, and some of the hottest Hip-Hop/ EDM and singer-songwriters who performed on stage. VIPs such as Eva La Rue (CSI), John Popper (Blues Traveler), Rob Morgan (Netflix Marvel Series), Matt Bomer (Walking Out), Mally Mall (Renown Hip-Hop Producer/Artist), Matt Walsh (Veep), Naven Twins (Global DJ duo), John Singleton (Director), Lil’ Nate Dogg (Hip-Hop Recording Artist), Curtiss Cook (Roxanne Roxanne, House of Cards), Caitlin O’Conner (2 and a Half Men, Ray Donovan), Elvis Nolasco (Roxanne Roxanne), Gretchen Rossi (RHOOC), Christina Carlson & Taylor Clarke Bennett (Singer-Songwriters) and more poured through the doors. Sponsors were on hand in their exclusive gifting lounge and eager to share their products and services with the VIPs. In parting the Indie Lounge, each VIP was introduced to Olympia backpacks containing Donna Bella, the Snake Venom collection for anti-aging and silky smooth skin, Maria Shireen (hair tie bracelets designed to integrate elastic with stylish jewelry, Pinner Test, next generation, mail-in blood testing for food intolerance, Nomadic State of Mind, hand-crafted, socially responsible vegan sandals, Mai Couture, makeup papers for quick and easy on-the-go touch ups, Magic Bullet, natural, anti-hangover eraser drink, Watch Ya’ Mouth, board game of hilarity, veteran-owned and American-made Leadslingers Whiskey & Spiced Rum, resort-style KARO Designer Swimwear with jewelry built into each piece, iPet iPals, providing soft and cuddly, fluffy friends to accessorize any MP3 device, Happy Kits,for the discrete smoker and more. VIP guests also received Getty image supported, one-of-a-kind Artist Project portraits by celebrity photographer Michael Bezjian. The Indie Lounge is always an exciting industry focused lounge to experience and we we’re happy to have been back there again this year. The ECOLUXE Luxury Lounge is one that always stands out for a myriad of reasons and their 2017, 10th annual, was no exception. Created by veteran TV/Film product placement producer Debbie Durkin of Durkin Entertainment. 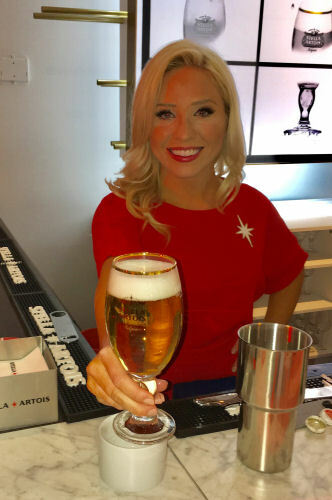 The Lounge is an experience that connects brands, environmental and charity causes with celebrities, media, influencers, social media rockstars and industry VIP’s. Held at the Blue Iguana on Main St. in Park City, the event was a great retreat for the industry to come in from the storms that blessed every day of opening weekend and connect with a host of unique and cutting edge products and services along with their partner charity, Shriner’s Children Medical Center. Highlights for the lounge this year were Jason Ritter who was all smiles, RHOOC star, Gretchen Christine Rossi, who hosted the Choices Recovery Media Center, where she interviewed film festival attendees and notables about the growing problem of addiction in the US. Shriners For Children Medical Center’s hospital executives were also on-site providing information about their new facility opening in Pasadena, CA in July 2017 and educated attendees about how they, as an organization, help serve children, heal kids, give hope and change countless lives. Additionally, featured indie music artists performed live inside The EcoLuxe Lounge’s bar, where fundraising efforts benefitted the new medical center. Today’s top music hits were spun by “Vanderpump Rules” star DJ Mike Shay of DAT DOPE GROUP. And if that wasn’t enough, throughout the day, guests enjoyed American homey–comfort foods with a modern twist, prepared by Executive Chef Dean Hottle from Snake Creek Grille in Heber, Utah. A non-GMO Modern Oats hot oatmeal bar, all served on RePurpose Compostables plates and flatware made from plants, with daily fresh roasted coffee by Park City Coffee Roaster, were also present. Tito’s Vodka made an appearance with their gluten-free vodka cocktails & signature BLOODIES BAR accompanied by TSINGTAO, a beer of imperial taste, living beyond the ordinary. Utah floral designer, Betsy Borden of Dancing Daisies Floral, created an all-organic, living eco-mountain forest wall installation for special celebrity arrivals. Veteran Canadian Olympian Mark Peros styled VIPs in CMFRCANADA, extreme winter, high-fashion coats. Barefoot ECO Outfitters dressed select stars in vintage-inspired, eco-friendly mountain apparel, while EPISCOPE premiered the launch of a new global app for writers, offering tools to get projects picked up. WHOLE HEALTH MEDICAL GROUP, a group of licensed Utah physicians, offered hangover, altitude, and anti-aging IVs for those interested to help replenish film-goers in their designated “Wellness Detox Spa”. SPA’lking About It Beauty Spa featured high-end skincare products for both men and women, while select name talent also received luxury resort stays at the ultra-private luxury 5-star Le Soleil d’Or Resort Cayman Brac – Cayman Islands – a top ten Caribbean boutique hotel on a 20 acre organic farm. 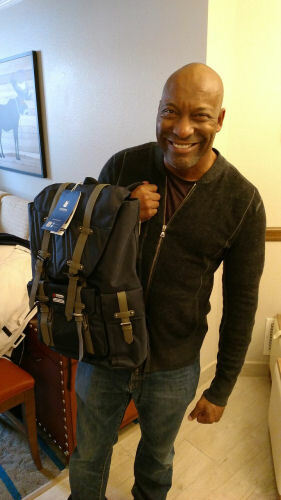 With that said, world travelers especially LOVED Chariot Travelware’s new hi-quality luggage designs and inventions. Other brand sponsors included: Spalking About It, AutismFoundation.Org, Colour Pop Cosmetics, Anchor Almond Butter Toffee, John Paul Pet Awapoochi Shampoo, and more! Millennium Magazine is always delighted to visit Ecoluxe Lounge to see what is new and looks forward to its festivities. 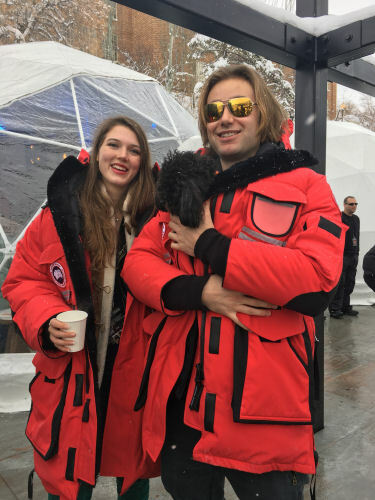 The Music Lodge held its Sundance 2017 for the10th year in a row where the Associated Press conducted their Festival interviews and chauffeured Tesla cars picked up and delivered VIPs and celebs. 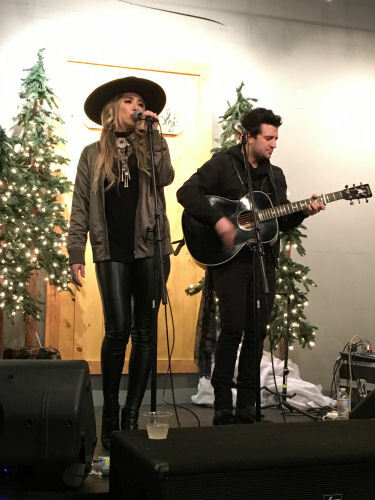 The Lounge showcased musical talent that included BC Jean & Mark Ballas who performed for a Creative Coalition (celebrity-based 501c3 charity) event. Other celebs that attended this year were John Legend, Tim Robbins Mary J. Blige, Peter Dinklege Carlos Santana, Jack Black Elijah Wood Shirley MacLaine, Elle Fanning, Anne Heche, Kevin Bacon, Jennifer Beals to name a few..
Tito’s Handmade Vodka and Uinta beer got the party started warming the VIPs from the inside with their spirits while Sponsors Freed & Freed Coat, Coolway USA boots and Grindstone Universal apparel kept the celebs warm on the outside. To top it off Garrett Popcorn and Over the Top Cookies took the edge off their hunger. 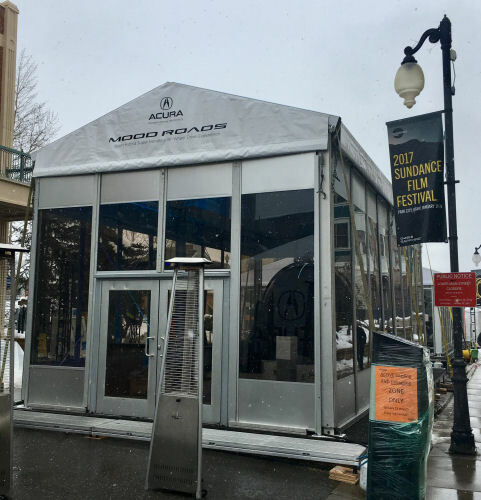 The Stella Artois Filmmaker’s Lodge at Sundance 2017 hinged on their collaboration with Matt Damon and Gary White’s (who were on site) Water.org. Their ‘Buy A Lady A Drink’ campaign during the lounge raised enough money from the sale of 1 challis to fund five years of clean drinking water for someone in a developing nation. Among other events held in the lounge was the ‘Women in Film Panel’, the Mudbound movie premiere party where Mary J. Blige came in support and The ‘Lemon’ movie event with cast member Judy Greer walking the red carpet. Sundance 2017 saw the return of Canon U.S.A to Main St., Park City. 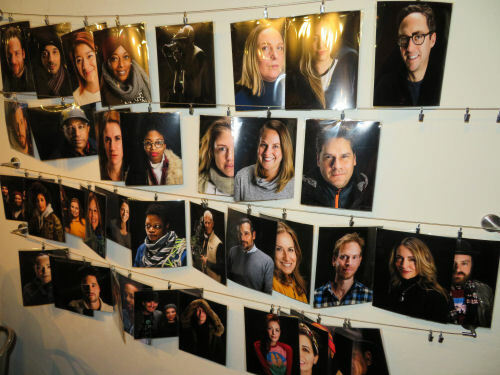 Invitees attended a professional portrait lounge in the cozy space with snacks & coffee for all. A filmmaker’s panel and award winning cinematographers interacted with Canon’s cutting edge equipment and a cocktail party for industry insiders capped off the festivities. Other Lounges for the VIP and Festival-goers alike where they could come out of the cold included the Canada Goose Lounge, the YouTube Lounge, the Acura Lounge and the Chase Sapphire Lounge.